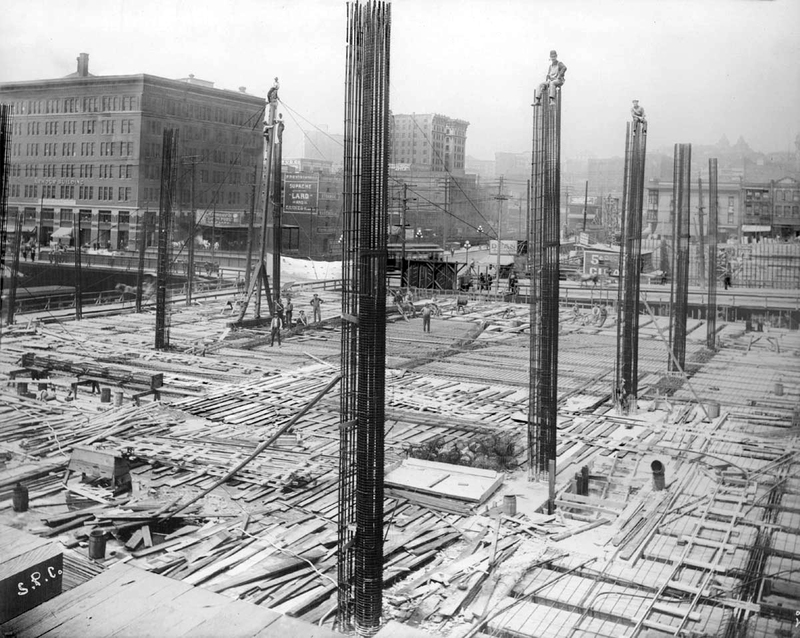 THEN: In the older scene daring steel workers pose atop construction towers during the 1910 building of the Union Depot that faces Jackson Street. NOW: About three blocks away – and ninety-one years later -- Travis Osborn works as a “connector” on the Seahawks Stadium during the summer of 2001. This is a “thematic” now and then, and construction – courageous construction – is the theme. Still the two settings are separated by only about three tideland blocks. In the older view steel workers have climbed to the tops of three of the many rebar towers being prepared for concrete in the construction of the Union Depot. This landmark Puget Sound terminus for both the Union Pacific and Milwaukee Road railroads was completed in 1911. While the last passenger train pulled away in 1971 the depot’s classical masses still distinguish most of the block between Jackson and King Streets, and Fifth and Fourth Avenues. A stricter contemporary repeat of the historical scene would have looked directly into the depot’s southeast corner near King Street and Fifth Avenue South. 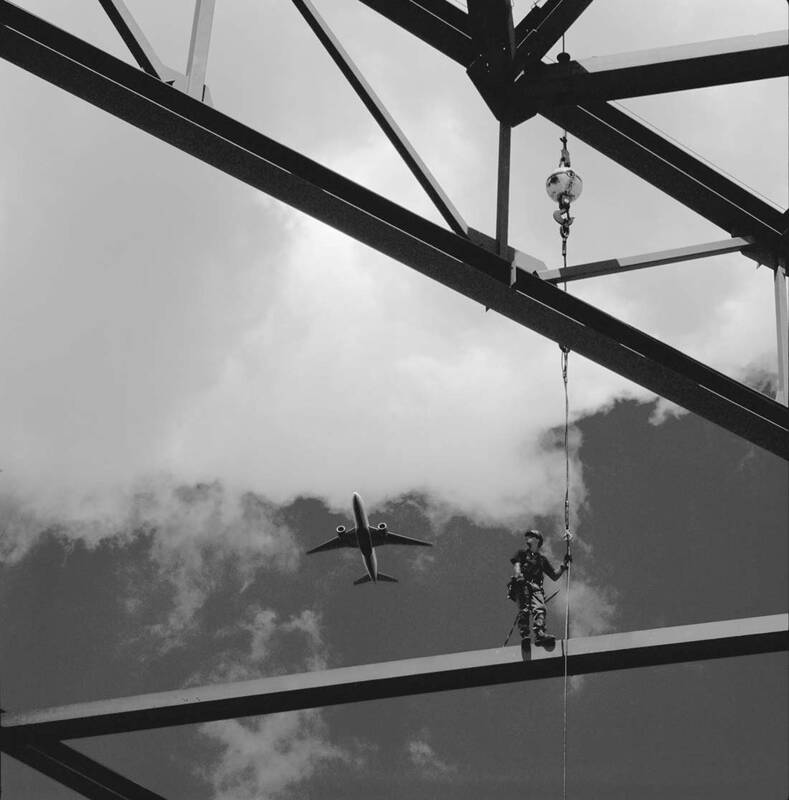 Instead when this “now and then” first appeared in Pacific Northwest Magazine on Sept. 1, 2002, we have used one of photographer Joe Crookes’ photograph of a daring steel worker balanced on a steel girder during the construction of the Seahawks Stadium (the original is in color). This and many more of Crookes’ stirring compositions were included in an exhibition of his work which was then hanging at the Museum of History and Industry. His subjects are a combination of mortal and monumental – ironworkers of Seattle Local 86 hanging on the exposed skeletons of the new football stadium during its construction. In the “Artist’s Statement” Crookes explains, “What began as a process to document the construction of an enormously complicated and unique structure metamorphosed into the discovery and enchantment of the intrinsic beauty in what would seem to be an artistically hostile environment. The ironworkers – cowboys riding beams and lassoing steel – became heroic, larger than life figures.” And we add, higher than ordinary life too. Considering the positions Crookes often took himself to take his shots, this artist is also heroic.